This is a cute costume that can be used for your partner, at a play party, or as a costume for Halloween. By adding a couple items ( a strapless bra, black tights) this would be a complete costume for a party, hat and sash included. This is a cute outfit from DreamGirl that is fit for a play party, surprising your significant other, or with a few modifications, a costume party. 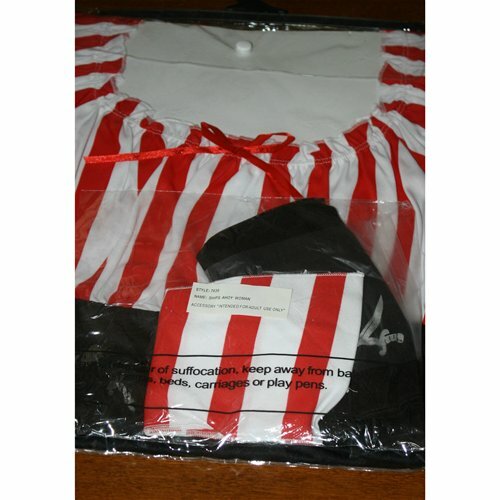 This outfit comes as a pleasant style, off the shoulder mini dress, a red and white striped sash, and a bandanna with a skull print in the center of it. 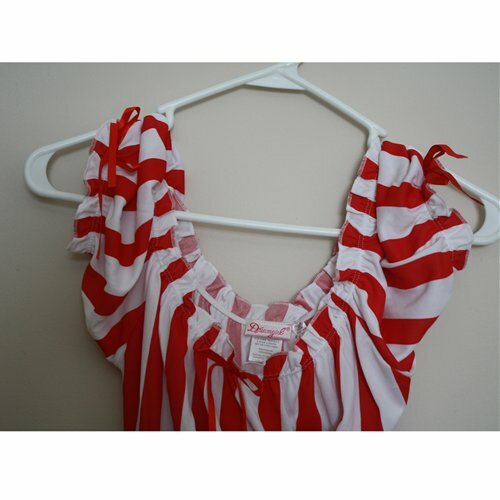 The top is red and white striped and is held in place with elastic around the top which creates a soft ruffle around the top. There are no under wires at the breast area so if support is a must for you, you may want to look at something else. You can wear a strapless bra with this if you choose. The top is seven inches from the center of the breast area to where the black part of the dress attaches. There is a little red bow on each sleeve and in the front center. The bottom of the dress is jagged and is relatively short, ranging from 18-20 inches. The picture show a pair of black thigh highs with it but they are not included in the package. 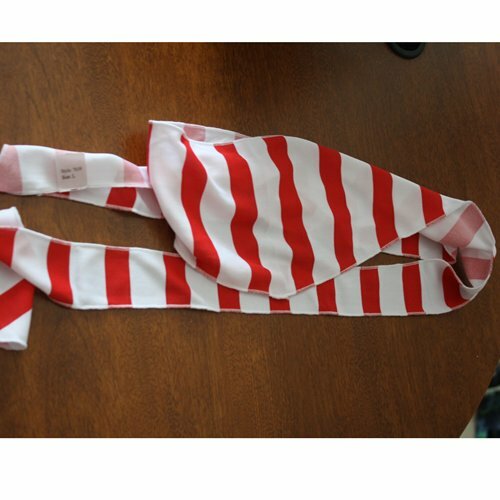 The red and white sash is 71 inches long and there is plenty of length to tie around you. The costume arrived in a clear sturdy plastic bag. The bag is strong enough that the costume can be stored in it if you choose. The bag has a hanger type top and has a snap closure in the back. The bag has a stamped warning on it saying this is intended for adult use only, age grade 14+. It also states it is made in China. It only weighs 0.6 lb. The costume is made of polyester and is stretchy in nature. It can be picked easily though so care must be taken to remember this. The sizing recommended from DreamGirl is pretty close to accurate. I ordered a size Large which is designed to fit weights of 140-160 pounds or 65kg-75kg. The size chart is listed below. The information on the web page says the cup size is 'one size fits most' and with the fullness of the top, this could be true. I had plenty of room in it and I wear a b size cup. This was the first costume we have used to add to our bedroom fun. When I first tried it on, I found it to be very comfortable and easy to adjust. Since it was just us at home, I didn't put on a strapless bra or leggings. When my hubby saw it, he grinned and asked when was the ship sailing! I don't usually like off the shoulder tops or ruffles but both of these features are pluses when it comes to this outfit. The sash was plenty long enough to pull to the side and tie and still have enough left hanging down. 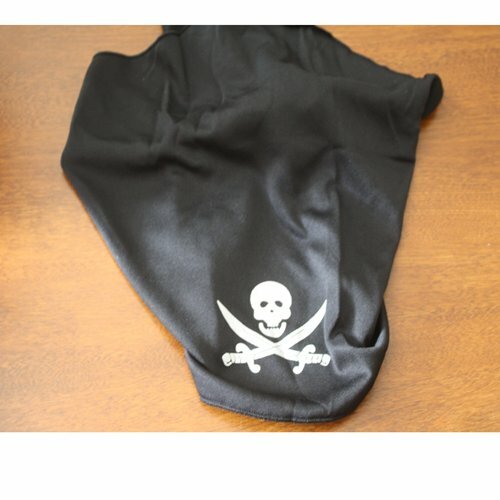 The bandanna is like a typical dew rag and it pulls to the back and ties with plenty of extra material to hang down in back. This could be worn as when riding the motorcycle except too many people would want to know where I got it. While it was comfortable and easy to get into, it was just as easy to get out of. The material was very giving and made removing it either over the head or sliding it down was simple. I'm thinking this will be a neat Halloween costume and all that needs to be added is a strapless bra and a pair of black leggings. I have worn this outfit a couple of times but I still think it will be next year's Halloween costume..with a bra and a pair of leggings! It has been washed and has held up well after that. It is also on sale right now so if anyone is interested, now would be the time to get it! Thank you for the review and pictures. The set looks really cheap, I doubt I will go for it. Thanks for the review and pics. It could be a fun set. thanks everyone..and yes, missmarc, it is cheap but figured it would be a good one to start with and if we didn't like it, we wouldn't be out anything. Great review, looks like fun. Thank you for viewing Ships Ahoy – costume review page!